I had a great time photographing the wedding of Damian and Leigh on Saturday. 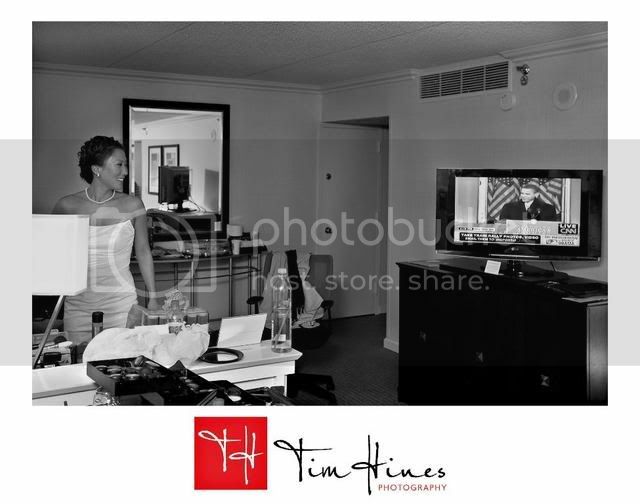 While in the Bridal suite getting ready we were able to see Obama on TV as he spoke in Philly. I think that everyone in the suite was excited to see Obama and his beautiful family. Leigh’s dad was clearly a big Obama supporter. In fact he incorporated Obama into the wedding toast by using the theme YES WE CAN. He even gave every family member an Obama t-shirt. I thought it was a unique toast. I thought about the toast that he made while I was watching Obama on the news today so I decided to look at some of the photos of the toast. Here are a few images from the toast and one from the bridal suite. I can’t wait to work on the rest of the photos. Is Obama looking over at Leigh? I’ll be shooting the wedding of Leigh and Damian this weekend. I met Leigh a few years ago when I was shooting a birthday party. I was just starting to photograph events at that time. Fortunately she added my contact information in her LinkedIn account. It also helped that I’m good friends with her wedding planner. I did an engagement session for this beautiful couple a few months ago around downtown Charlotte. Here are a few from that session. Happy New Year!!! Last year I procrastinated about blogging so this year I have made a resolution to start blogging. This is my first post of many more. I hope to keep the blog updated throughout the year. I recently had the privilege of shooting engagement photos for Shannon and Kason. Kason and I both pledged Kappa Alpha Psi at Florida State but he pledged several years later. I am honored that he and his fiance drove up to Charlotte to allow me to shoot their engagement pictures. We had a great time even though it was a cold and overcast day. Here are a few photos from the day. Beautiful! Congrats on the new blog. It is about time! Excellent session! They will love these!